Usually Moscow roads during the busy work day or even at weekends look like on the pic above. But when The President needs to pass through Moscow streets thousands of policemen clear up Moscow streets fully blocking them from access of any cars, causing multi miles traffic jams in nearby streets, sometimes for hours. With an effort of road police and state guard the crowded streets are turned into empty road surfaces 20-30 minutes before His coming. As I said the nearby streets don’t look like that, they are very jammed with cars seeking their alternative way thus causing the whole traffic to jam. And here He is. One Mercedes limo with The President and Mercedes SUVs with guard. Just some minutes later the jammed traffic masses from the neighbor streets would rush upon those virgin roads. that is just a little bit more insane than here in Denmark! 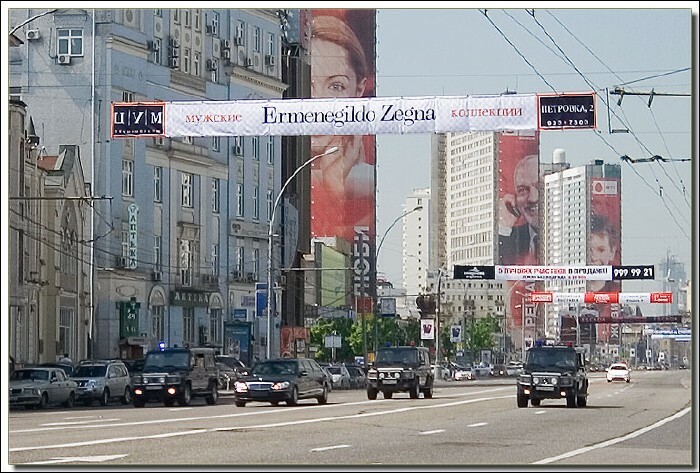 Once I saw ambulance sirens on standing on a traffic jam on nevsky pr. in St:Pete without any reactions from other drivers to make way. But then some official state mercedes with blue lights and those f#%&¤&n annoying high sirens appeared and everyone made road to them on that second. But when ambulance tried to follow the official cars, other drivers blocked its way straigt away. Russia has many brilliant people. Why cant they solve traffic? Time to fix this problem. 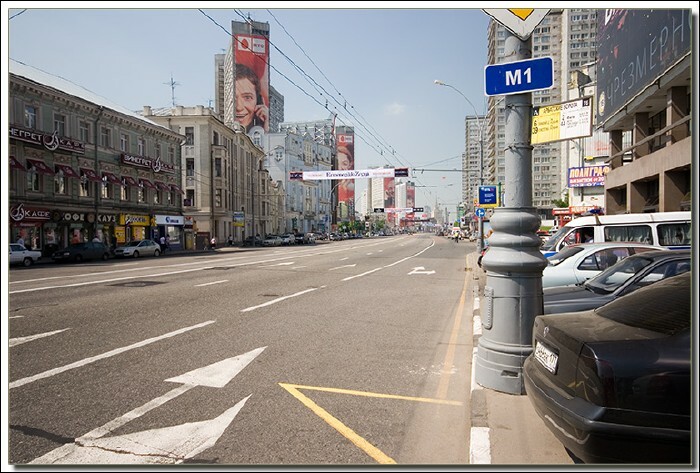 Moscow is great city, and should have better road system. How about a “congestion charge” like we have in London and many other cities? For example, back in the Soviet times there was little food or toilet paper (had to use newspaper instead), all products were very low quality and fully manual (washing “machines”, using a knife to open a can, etc. ), yet they managed to send the first person to space. Also many people have come up with ingenious solutions (which the average westerner would never have imagined) to common, everyday problems that could be solved easily with a better design (which was never done). alright, problem is that the road has enough capacity for 100 cars a minute, it needs 5 times that to meet demand… give us something ingenious (moving the people to the metro doesn’t seem to work either). you really think this? Then my friend, you are hopelessly infected with the propaganda they feed you for over 60 years. I lived in communism and no matter how bad, I’d never ever think to going back. Products were natural??? That’s all you can say about the lack of everything in that age? Bah! Why am I wasting my time? In Russia is is not compulsory to state on the packaging what ingredients or processes have been used to create the product, like in Europe and the US. And Russian manufacturers are very opposed against such a rule, because in many cases they could close down their factory straight away. Russia puts people in space, designs super jet fighters etc etc, but a non-sticking frying pan or a car that can compete with other brands… no. Why do you think Putin and his guards are driving Mercedes ? That so true about kolbasa. I once visited “Myasokombinat” (meat factory) where kolbasa and other sausages were made. One of my friends used to work there. Anyway, he was giving me tour and we entered a room where all the unprocessed meat was kept. What I saw, stayed with me to this moment. All the corpses of the dead animals were laid on the flour, and on top of them I must have seen at least five rats if not more climbing and feeding on pieces of meat. After having seen that I would not buy any prepackaged russian meat products to this day. However this was in the late 90’s and might be a bit optimistic in saying this, but I truly hope the quality of russian meat products has improved since then. They can’t solve the traffic problem because that would involve asking for help from the traffic engineers of other countries… And a Russian, as a matter of pride will never, under any circumstances ask for help, nor will they accept help or advice even if offered. They would rather bumble along for however many decades it takes and figure it out for themselves..
Moscow had the widest city streets I’ve ever seen! I felt as if I was driving on an interstate, but in the city with traffic lights. In the 90’s you could by such privilege, as you could just about everything else. Just imagine the damage to the London economy if blair would do this everytime he leaves for and from Downing Street! This happens in the Uk (though a smaller scale) when Tony Bliar goes to Parliament. Rejoice everyone, just a few more days of Bliar, can we have Putin instead? Ha, ha! In America we use helicopter for this. No problem clogging up the streets. Streets free for everyone. President overhead in helicopter, not in streets in limo. Not always true. George Bush visited Los Angeles a couple of times, the traffic was horrible. in my country , many people have the right , also the company owner . traffic jam pictures are stolen from Anton Nosik’s archive. the “clear way” pictures are depicting entirely different street. AND: on 1st photo in Moskow evening – all road in shadow from buildings. On photo with emty streets something like middle day. M1 route is Novii Arbat?